Industrial semi-welded gasketed plate heat exchangers are used when gaskets are not suitable as one of the process media. Semi-welded GPHEs can also take a higher design pressure compared to fully gasketed plate-and-frame heat exchangers. 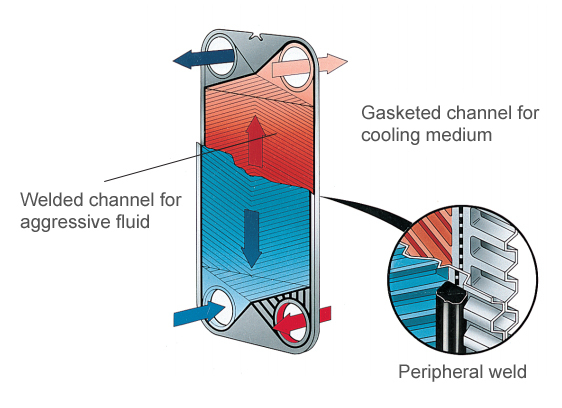 In the Semi-welded heat exchanger the refrigerant flows in laser-welded, sealed plate channels, and in the opposite channel the liquid brine flows in gasketed channels. The Industrial semi-welded line can be configured in many ways. The animation shows single pass configuration of a fully gasketed plate-and-frame heat exchanger. The flow principle of a semi-welded heat exchanger is the same. The difference is that every second channel is sealed with a laser weld instead of a gasket. Multi pass with 2 or more passes on each side is also possible. It's important to understand that all gasketed plate heat exchangers are not the same. The features highlighted below are important components to look for in a GPHE, and when combined, these features offer extensive benefits, such as reduced total cost of ownership, higher efficiency and increased staff safety. The sealing weld is positioned separately - outside the ring gasket, which ensures equal sealing force over the entire port hole gasket, guaranteeing higher performance through the welded channel. The sealing weld is commonly placed inside the ring gasket groove. This combined with an uneven port hole groove can lead to gasket material stress and can eventually lead to gasket failure. 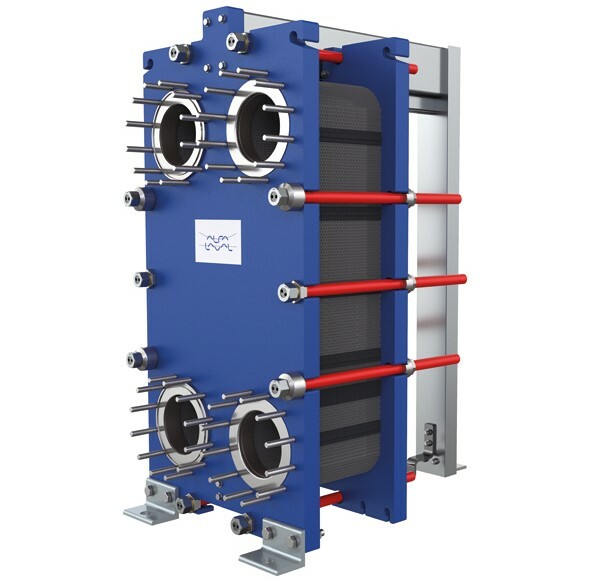 One of the most important features of a plate heat exchanger, the distribution area ensures full use of the heat transfer area and minimizes fouling. An inefficient distribution area with uneven flow causes maldistrubution and fouling build up. A glue free gasket with superior alignment that ensures a perfect seal and trouble-free maintenance. Fastening to the plate is improved by having five fastening points. Other gasket designs, such as snap-in gaskets, only have one fastening point to the plate. If this one point is lost, there is no gasket fastening function.